SAN FRANCISCO – The Los Angeles Dodgers clinched baseball’s final playoff berth and gave themselves a chance to still win the N.L. West, getting a go-ahead triple from Manny Machado in the eighth inning Saturday and beating the San Francisco Giants 10-6. The defending N.L. champions locked up their sixth straight trip to the postseason, assuring at least a spot in the wild-card game. The Dodgers joined Colorado, Atlanta, the Chicago Cubs and Milwaukee in the N.L. playoff field. Los Angeles began the day one game behind Colorado for the division lead, and the Rockies lost to Washington later in the day. 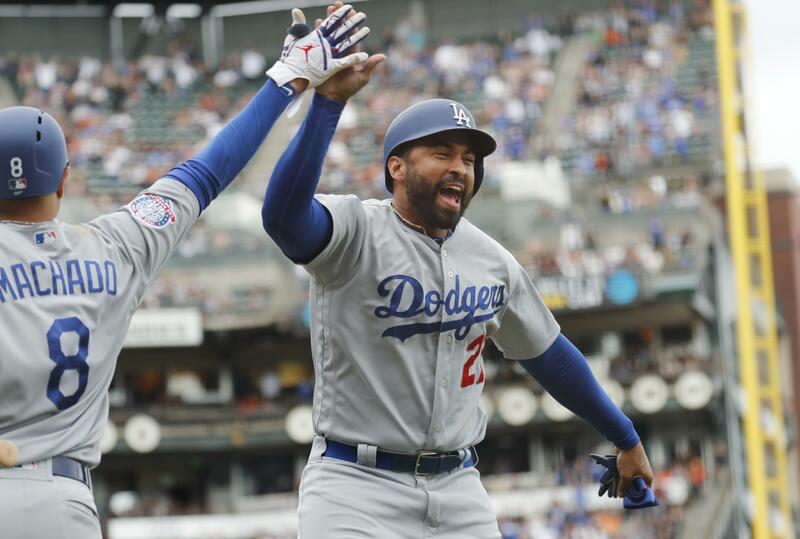 The regular season is scheduled to end Sunday – if Los Angeles and Colorado finish even, there will be a one-game tiebreaker for the West title Monday at Dodger Stadium. Machado, the star infielder acquired from Baltimore during the All-Star break, hit a two-out triple off Mark Melancon (1-4) for a 6-5 lead. Max Muncy added a two-run double during a four-run ninth. CHICAGO – The Cubs wasted a solid performance by Cole Hamels, sending the N.L. Central race to the final day of the season. The Cubs would have wrapped up their third straight division championship with a victory and a loss by the Brewers to Detroit. Chicago and Milwaukee would meet in a tiebreaker at Wrigley Field on Monday if they wind up with identical records, with the loser then playing in a wild-card game at home on Tuesday. The Cardinals kept alive their chance for a wild card, but were eliminated by the Dodgers’ 10-6 victory at San Francisco. Miles Mikolas (18-4) pitched eight effective innings in his fifth straight win, and Carlos Martinez worked a perfect ninth for his fifth save in five chances. Hamels (4-3) gave up two runs, one earned, and three hits in seven innings. DENVER – The Colorado Rockies dropped into a tie with Los Angeles for the N.L. West lead with only one game left, routed by Stephen Strasburg, Juan Soto and the Nationals. Hoping to hold their one-game edge, the Rockies instead saw their winning streak end at eight. The Dodgers were 10-6 winners in San Francisco earlier to ensure the race will go down to the wire. BOSTON – Gleyber Torres and Giancarlo Stanton connected as the Yankees broke the major league record for home runs in a season and reached 100 wins. Torres’ two-run drive in the fourth was the Yankees’ 265th of the year and moved them past the 1997 Seattle Mariners. Stanton pushed the record to 266 in the seventh with his 38th homer, a solo homer to left field. A fan sitting in the seats above the Green Monster threw the souvenir back, and the ball bounced into Stanton as he rounded second base. New York, which will host Oakland in the A.L. wild-card game on Wednesday, reached 100 wins for the 20th time in franchise history. Brock Holt hit a two-run homer for the A.L. East champion Red Sox, who could be hosting the Yankees again in the A.L. Division Series starting week. Eduardo Rodriguez (12-5) got the loss. Lance Lynn (10-10) got the win with three innings of relief. Aroldis Chapman earned his 32nd save. BALTIMORE – Justin Verlander struck out 10 in six scoreless innings, helping the Astros take the opener of a doubleheader. Houston shortstop Carlos Correa homered and hit a tiebreaking RBI double in the ninth inning. Will Harris (5-3) worked the eighth and Hector Rondon got three outs for his 15th save. Verlander allowed three hits and walked one. His next outing will come in the postseason, which begins for Houston on Friday against Cleveland. Baltimore’s DJ Stewart tied it with a three-run homer off Joe Smith in the seventh. Sean Gilmartin (1-1) got the loss. In the nightcap, Myles Straw hit his first big league homer and Brian McCann also went deep against rookie Yefry Ramirez (1-8). Jake Marisnick made it 5-2 with a two-run shot in the eighth. Dallas Keuchel started and went three innings in his final tuneup for the playoffs. Brad Peacock (3-4) worked the fourth and Ryan Pressly pitched the ninth for his second save. Baltimore enters Sunday’s finale as one of only five big league teams since 1900 to lose 115 games. ST. PETERSBURG, Fla. – C.J. Cron and Austin Meadows homered, powering Tampa Bay to the win. Rays left-hander Blake Snell struck out 10 in five innings, but failed to win his 10th straight start. He was charged with a run and three hits. Diego Castillo (4-2) got the win with two innings of relief. Sergio Romo pitched the ninth for his 25th save despite giving up a pinch-hit homer to Reese McGuire. Snell finished with a 21-5 record and a 1.89 ERA. Cron’s 30th homer got Tampa Bay on the board in the second, and Meadows put the Rays ahead for the first time with another homer off Ryan Borucki (4-6) in the seventh. CINCINNATI – Michael Lorenzen singled home a run and got his first victory as a starter since 2015, helping Cincinnati snap its seven-game losing streak against Pittsburgh. Pittsburgh has dominated the Ohio River rivalry, going 13-5 this season. The seven-game winning streak was the Pirates’ longest against the Reds since 1991. The Reds let Lorenzen (4-2) make three starts to finish the season after 42 relief appearances. He went 5 2/3 innings and gave up five hits. Raisel Iglesias got three outs for his 30th save in 34 chances. Eugenio Suarez homered for the second straight game off Jameson Taillon (14-10), pulling out of his slump. MILWAUKEE – The Milwaukee Brewers moved into a tie for first place in the N.L. Central with one game remaining in the regular season, getting two homers from MVP candidate Christian Yelich to beat Detroit and draw even with the Chicago Cubs. The Brewers (94-67) were already assured of making their first playoff appearance since 2011, the last time they won the N.L. Central. They sure would like to get into the postseason again as a division winner, and Chicago opened the door by losing 2-1 to St. Louis earlier. PHILADELPHIA – Aaron Nola pitched seven shutout innings and Cesar Hernandez had a two-run single in the seventh inning to help the Philadelphia Phillies snap a nine-game losing streak. Nola (17-6) was stellar in his final start of the season, allowing two hits and striking out eight with four walks. The right-hander ended 2018 with a 2.37 ERA and 224 strikeouts in 212 1/3 innings. He likely will fall short of a N.L. Cy Young award after stumbling a bit in September. The N.L. East champion Braves will play either the Los Angeles Dodgers or Colorado Rockies in the NLDS, and Atlanta still could host the series. The Braves (90-71) and Dodgers have the same record entering the regular-season finale on Sunday while Colorado entered Saturday with a 90-70 mark. Anibal Sanchez matched Nola, giving up three hits with seven strikeouts and three walks in six shutout innings. Odubel Herrera helped the Phillies take a 3-0 lead when he beat out a potential double-play grounder to short. Seranthony Dominguez pitched a scoreless ninth for his 15th save in 19 chances. MINNEAPOLIS – Joe Mauer reached base three times and Kyle Gibson capped a season of improvement with six quality innings as Minnesota matched a season high with its fifth straight win. Mauer had two hits and scored twice in what could be his final homestand after a 15-year career in Minnesota. Mauer has said he’ll contemplate retirement once the season is over, but he’s showing he can still swing the bat with a strong September. Mauer, who entered the day with a major league-leading .410 average with runners in scoring position, drove in a run with a single as part of a six-run second inning. He is hitting .365 with eight RBIs in his last 16 games. Gibson (10-13) allowed one run on three hits and three walks to lower his ERA to 3.62. Jorge Polanco added three hits and Jake Cave drove in three runs for the Twins. KANSAS CITY, Mo. – Adalberto Mondesi hit a tiebreaking, three-run homer to lift Kansas City. Corey Kluber gave up three runs and seven hits in five innings in his final regular season start for Cleveland while working on a short pitch count ahead of the playoffs. Indians catcher Yan Gomes left the game in the bottom of the third with an injured right hand after he was hit by Alex Gordon’s bat on a backswing as he attempted to throw out would-be base-stealer Mondesi. SAN DIEGO – Rookie Ildemaro Vargas hit his first home run, got his first stolen base and drove in three runs to lead Arizona. NEW YORK – Much like the last few years of his truncated career, David Wright’s finale was no fairytale at the plate. Wright left to a long standing ovation before a sellout crowd at Citi Field in his farewell game for the Mets. The team captain went 0 for 1 with a walk against the Marlins. He was removed after two plate appearances as planned, and on defense he handled a one-hopper to third base with no problem. SEATTLE – Dee Gordon drove in the go-ahead run with a triple in the seventh inning, and James Paxton struck out nine to go over 200 for the season to lead the Mariners. Paxton came into the day with 199 strikeouts and wasted no time becoming the sixth pitcher in team history to reach 200, striking out leadoff batter Jurickson Profar. It was one of nine strikeouts in the game for Paxton, who allowed one run and seven hits over six innings and didn’t give up a walk. Seattle’s ace become the first Mariners pitcher to reach the 200 strikeout mark since Felix Hernandez in 2014. Nick Vincent (4-4) pitched a perfect seventh inning to earn the win, and Edwin Diaz earned his league-leading 57th save, tying Bobby Thigpen’s 1990 mark for second-most all time. Texas starter Adrian Sampson (0-3) held Seattle scoreless through four innings. He ended up allowing three runs and seven hits, with four strikeouts and no walks. ANAHEIM, Calif. – Khris Davis hit his major league-leading 48th homer and the Athletics locked up their winningest season in 16 years. Jed Lowrie homered and drove in two runs for the playoff-bound A’s (97-64), who hadn’t won 97 games since going 103-59 in 2002. A majors-best 42-22 since the All-Star break, the A’s are already locked into a trip to New York on Wednesday for the A.L. wild card playoff game against the Yankees. Kaleb Cowart had an RBI single for the Angels, whose four-game winning streak ended with a landmark loss. The Angels (79-82) are guaranteed to finish with three consecutive losing records for the first time under manager Mike Scioscia, who hasn’t announced whether his 19-year tenure is over. Mike Trout, Shohei Ohtani and Justin Upton each went 0 for 4 for the Angels, who have made the playoffs just once since 2009 despite their annually bulky payroll. The Halos hadn’t had three straight losing seasons since 1992-94. Liam Hendriks pitched the first inning, allowing one single, before Trevor Cahill (7-4) threw four innings of one-hit ball for the A’s. Davis connected in the first off Tyler Skaggs (8-10), driving a two-run shot for his ninth homer in September and his fifth in seven games. The 30-year-old slugger matched Jimmie Foxx’s 48 homers in 1933 for the fourth-most in a single season in A’s history. Published: Sept. 29, 2018, 10:10 p.m.